It’s finished! My tiny bathroom makeover, that I thought would only take a few days and ended up taking over a month, is finally done. If you’ll remember, this bathroom was just completely disgusting. The most disturbing part was the flooring, which had curled up all along the edges of the walls and around the toilet, and had become a trap for dirt and grime that was impossible to clean. And then the walls and old toilet weren’t much better. Then there were the hideous wood cabinets. The whole thing was just gross…and old…and gross. But now, the walls have been clad with tongue and groove wood slats, the flooring has been replaced with groutable vinyl tile, the old toilet has been replaced with a shiny new one, and the cabinets have been given a new coat of white paint. I also removed the old flat hollow core door and replaced it with a new six panel door (which is painted the same white as the cabinets, but appears blue because of my bad photography. 🙂 ). It looks so much better now with it’s new white paint, new hardware (even though I used the cheapest I could find! 🙂 ), and new countertop. As I said before, I do wish I had taken the time to make new cabinet doors. That’s probably the thing I’m the least pleased with in this whole makeover. But oh well. I’ll leave that project for the new owners. 🙂 Even with the old doors, I do think that a coat of white paint made a world of difference. The original shower had a really old (and gross, of course) shower door. The shower is small, but the door made the shower look even tinier. Now the door has been removed, the grout has been cleaned, and cleaned, and clean, and then brightened with Grout Renew. 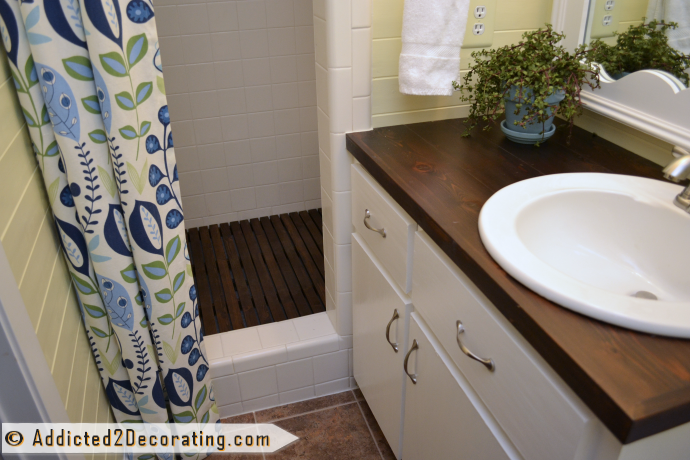 I also added a cedar shower floor mat and a decorative shower curtain just to add some color and interest. Of course, the sole purpose for the curtain is just to add some softness and color. 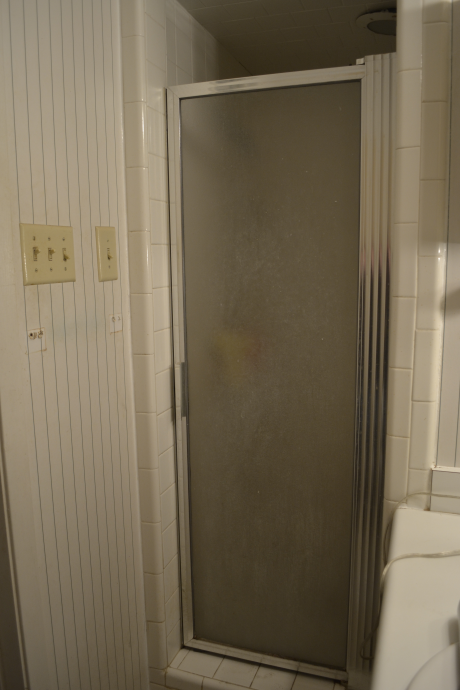 The actual usable shower curtain is hung on the inside in a tension rod, and slides out of view when not in use. The decorative shower curtain is hung on a simple, inexpensive curtain rod. I only had room for one of the finials, so the other side attached directly to the wall using a curtain rod extender (one of those screws that has threads on each end that you use to attach two wood curtain rods), with one end screwed into the wall, and the other end screwed into the end of the curtain rod where the finial was supposed to be screwed in. 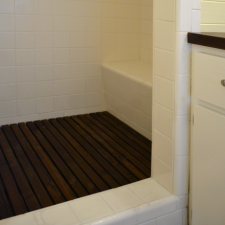 I think my favorite features of the new bathroom are the countertop and the cedar shower floor mat. I always love the warmth that wood adds to a room. In total, I estimate that this makeover cost about $600, including the new toilet, faucet, towel ring, light, six panel door, and towel/robe hook on the door. The source list is pretty short for this bathroom. I bought all of the items listed above, plus all of the supplies for the mirror and shower floor mat, plus the paint and other items, from Home Depot. I even bought the little succulent plant there. 🙂 Only the fabric for the decorative curtain came from another store. I got it at JoAnn Fabrics. It’s one of their home decorator 45-inch fabrics, regularly priced at $9.99 per yard, but I got it during a 50% off sale. One of the biggest expenses was the wood for the walls, and quite honestly, I would never use that stuff again. The tongue and groove panels aren’t completely flat, and some of them are noticeably warped. (They came out of the package like that.) Also, they have really rough spots all over that have to be sanded, and then there are knot holes all over. If I ever do planked walls again, I’ll stick with the hardboard cut into strips the size I want, like I used in the other bathroom. It’s easier to work with, perfectly smooth, lies perfectly flat against the wall, and costs a fraction of the price. 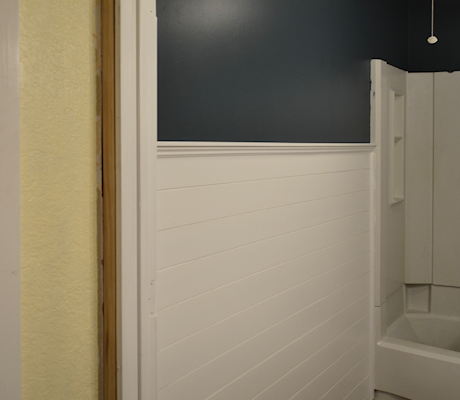 Plus, there’s no caulking necessary since any tiny slivers of space between the wall and the hardboard are easily filled when priming and painting. Looks great! Where did you get your decorative curtain? I love it! I made the shower curtain with fabric that I found at JoAnn Fabrics. It’s one of their 45-inch home decorator fabrics that costs $9.99/yard, but I bought it during a 50% off sale. Kristi, Outstanding job. And it’s not your best? I think it turned out great. I love the colors you selected. 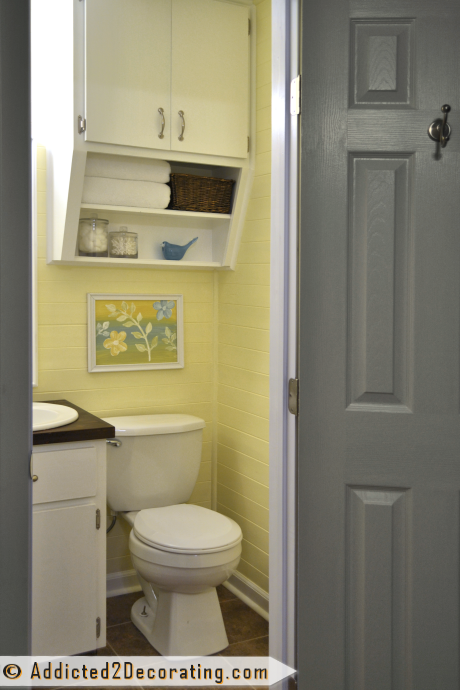 That storage cabinet over the toilet is a good use of space and it looks nice in white! Great job. So happy that you are done and are moving on to the black room. I was so curious about what you said yesterday that I hunted down that blog/forum and spent a few hours reading things about YHL. I am ashamed to say that I did because I don’t want to feed the monster, but I was shocked by the comments. I don’t know how bloggers can stand being picked apart like that. Good thing it hasn’t happened to you. How charming! 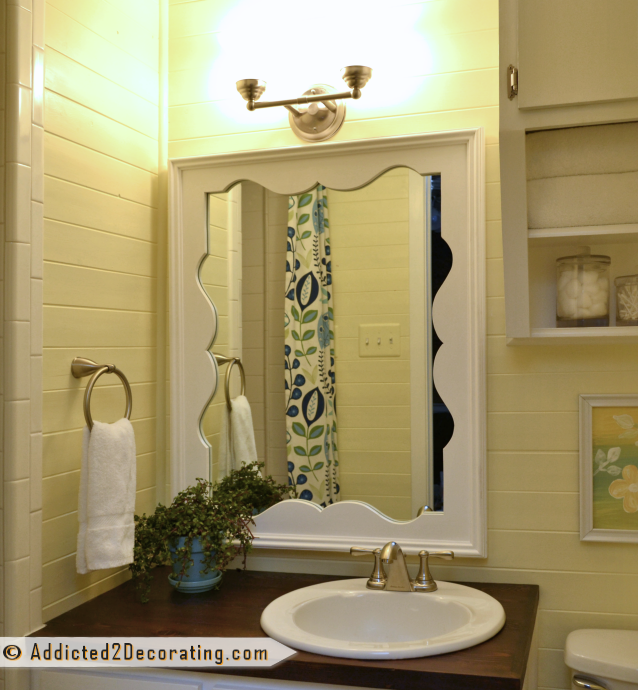 It has a lovely cottage look, and I love how the shower curtain and blue door add that perfect pop of color. It looks just great!! Somebody is going to get a wonderful place to live!! Actually, this is probably my favorite makeover in your condo. The shower curtain just “makes” the room. Great job. This looks so lovely! Love the shower curtain fabric, the art and decorative touches. You did a fabulous job! However, the last few weeks, you have been an especially needed source of ideas and inspiration. The Sunday before Memorial Day, we had a house fire that traveled from our garage (electrical short in the dryer), up into our roof, down the walls, and through our a/c vents. Hubby, the boys, the dog, and I are all fine, but our home has been getting a major re-do. Thank you for putting yourself and your ideas out there. P.S. I LOVE your shower curtain. Would you mind sharing the source? It would look terrific in the boys bathroom. Lisa, I’m so sorry to hear about your house fire!! So glad that no one was hurt (or worse) by it, but it’s still such a devastating thing to have happen. I hope you get everything back to normal soon. As far as the shower curtain, I made it with fabric that I found at JoAnn Fabrics. It’s one of their 45-inch cotton home decorator fabrics that costs $9.99/yard, but I bought it during a 50% off sale. It looks amazing!!! I love it…. you are so talented! 🙂 (And everything is so professional looking… I wish you’d get a show of your own….HGTV needs you. Something versatile and cool projects every day. 🙂 Nice job! We have about the same size bathroom so I’m wondering where you are hanging your bath towels since I don’t see that shown. Beautiful work! I’d love a reply. It looks amazing and fits so nicely with the rest of the house. I think you did a great job of selecting projects worth plunking money into (the counter top) and things that could just be spruced up (the cabinets). Also the shower looks spectacular now! Ha, even your “I would have done this differently” rooms end up looking fab! I think the future buyers of your condo will be bowled over by all the attention to detail in every room! Wow..you got the grout and those tiles so clean! I’m impressed. It’s an absolutely darling bathroom!! I did spend HOURS cleaning and scrubbing the tiles and grout with just about every cleaner and scrubby thing I could find, but the real magic happened when I applied the Grout Renew. 😉 That stuff works miracles on 30-year-old grout! Hah! I guess it’s because it just looks so much brighter and fresher now! AH-MAZING! You may not think it’s one of your best makeovers, but I gotta tell you, the before and after from out here on the web is very, very impressive. You said it first, so I will reiterate – the before was just plain gross! The after is just so fresh and clean and it really looks high end. 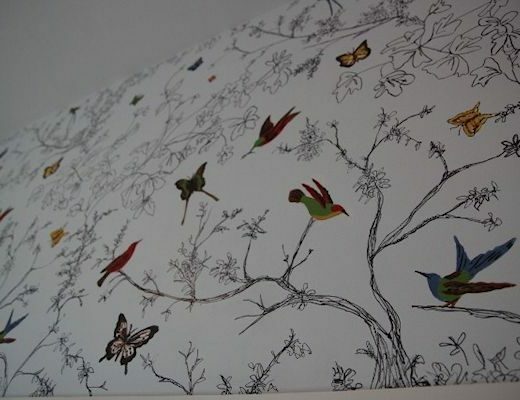 Even though you’d have used a different method, the walls really look gorgeous. 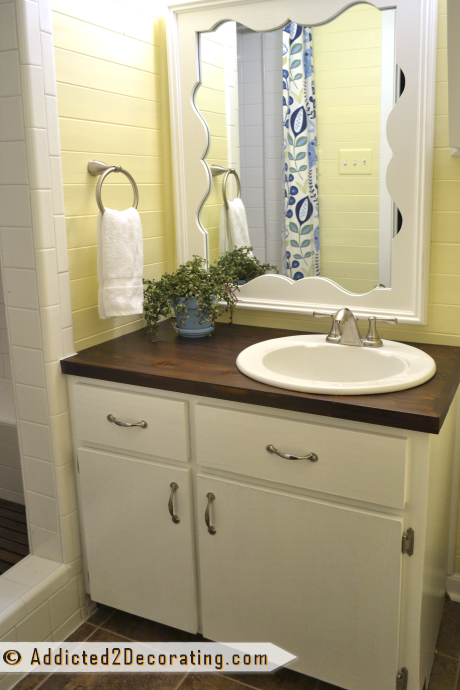 The vanity looks like a different piece altogether with the white paint, and if you end up deciding to keep the property and the vanity is really bugging you, you could change out the drawer fronts and doors quite readily as you did in the other bath. As always, I remain impressed with your ability and skill, and your creativity and stick-to-it-iveness. Such a refreshing makeover. I love you eye for color and clean lines. Wow, that is a wonderful transformation. I really miss “Design on a Dime” type HGTV shows (now that everything hour after hour is shopping for homes). Your work is just inspiring. Kristi, You have out done yourself once again! This bathroom is amazing! I really love the soft yellow on the walls and I know you have used it in other rooms, but if you have mentioned what the name is I missed it. Could you please list it again, I would love to use it in my bedroom I am re-doing. Thank you so much and btw, I loved yesterdays blog post about why you do what you do. I know yours is the one I get most excited to see arrive in my inbox!! The yellow color is called Rich Cream. It’s a Behr color from Home Depot. A good, soft, creamy yellow is hard to find, and I’m thrilled with this. It’s the same that I have in my living room, breakfast room, hallway, and kitchen. In the living room, I had originally tried the color that’s one step down on the color card, and YIKES!! It was SOO “in your face” yellow. Amazing how just the tiniest bit of added color can make such a huge difference. But this one is soft and buttery. 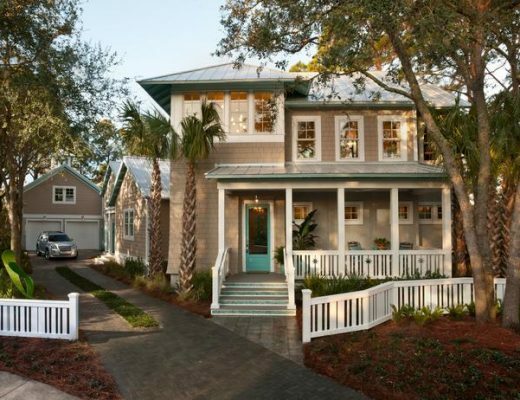 Don’t sell yourself short—this is a wonderful makeover! I do understand though, sometimes an artist is his/her own worst critic. Seriously though, great job! It’s so much brighter, crisper, and cozy. You could probably get an electrician out there to move that box. I don’t think it would be very expensive, but get an estimate – and make sure he is licensed! Well the problem here is that there is no place close enough to the original box to put it…so would be an intense move in which I do not want to get involved in. thanks for taking the time to give me a suggestion however. Oh wow…what a place for a breaker box! 😀 I definitely think you could make some sort of mirror just to hang right over it. If yours is anything like mine (and the others that I’ve seen), the door to the box sticks out about 1/8 inch from the wall, and maybe 1/4 inch if you count the little handle thing on the door. If that’s the case, then something like the mirror that I made for this bathroom would work to cover it. If you’ll go back and look at the construction, you’ll see that the rabbet that I made on the back uses 1″ x 2″ lumber. That means that the rabbet is about 3/4-inch deep. The mirror that I used is 1/4-inch thick, and it’s really heavy. 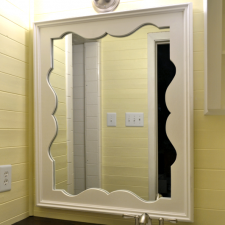 But generally in a frame, a 1/8-inch mirror is used, which would give a space of about 5/8 inch from the back of the mirror to the wall, which would allow room for the breaker box door. As far as putting it on a hinge, I’m not sure I would recommend that. I think as long as you’re using the thin 1/8-inch mirror, the mirror should be light enough to easily remove from the wall if you need access to the breaker box. And if you use an OOK Hangman French cleat to hang the mirror, it’s so simple to just lift it off if you need to remove the mirror from the wall. 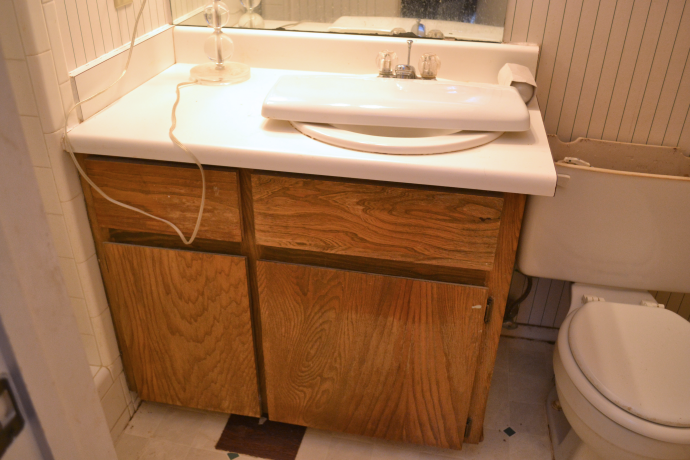 Thank you for taking the time to answer me on this….We have lived here for 3 years and this bathroom is just an eyesore and mainly because of the power box…must have been a last minute decision to put a bathroom here. I like the idea of the cleat to hang it…I was afraid the hinge would get bent because of the weight of the mirror and frame also. This may very well be my answer for this long time problem….will let you know if it works for me…course I am not as fast as you….so it will takes weeks for me to do this. thanks again. Kristi, LOVE your bathroom makeover. I like the soft buttery yellow with white. This was the very best in a makeover. Thanks for inspiring and challenging at the same time. Can’t wait to see what you’ll come up with next. This space looks absolutely perfect to me! Your hard work has paid off and the new owners will be so pleased that you’re such a perfectionist! Thanks for sharing your labors of love. Awesome job, Kristi. I have an idea for you. 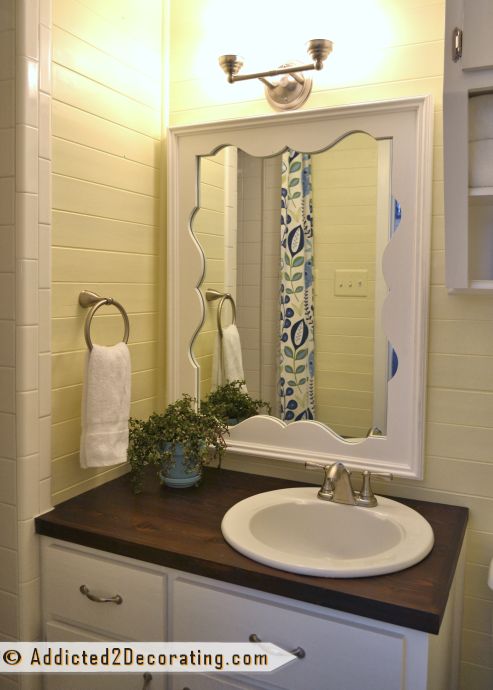 If you want a quick, inexpensive upgrade to your vanity, buy some lattice board (thin and about 1″ wide) and trim out the edges of the drawers and the cupboards and then repaint. You may to redo the handles on your cupboards, but it’d be an easy update and inexpensive, too. Just an idea. I know you’ve stuck a fork in this project, though. Either way, it looks awesome. I’ve used those tongue and groove boards before, too. I didn’t paint them though, but still, there were a lot of split, warped and chipped tongues and grooves which amounted to some lost square footage. Where did you use the tongue and groove boards? If you didn’t paint, did you stain them? Or just leave them natural? And yes, the split, warped, and chipped areas were a pain. I’ll definitely never use these again. Tiny bathroom is awesome. You added just the right touch with that shower curtain. What a difference! Everything looks so nice and uncluttered. By the way, my monitor makes the door look like a blue/gray color and it looks great with the yellow and white! Oh, I think it looks beautiful! I would LOVE to use that bathroom every! day. I love small, cozy spaces and this definitely is small and the shower curtain, shower floor, and vanity top make it look so cozy! I so look forward to receiving emails that you have a new post about your house!!! I love what you have done with such a small room, beautiful as always! Kristi, you are way too modest. It is fresh and inviting (for a bathroom). I join everyone else at being blown away by your creativity. I have started to wonder if you also have plumbing skills. Did you replace the faucet yourself? Brenda, it’s a stretch to say that I have plumbing “skills”. 😀 It’s more accurate to say that I muddle through and do the best I can. I’ve installed a dishwasher (probably THE hardest DIY project I’ve ever done and brought me to tears), installed a garbage disposal, replaced a couple of sinks and faucets, installed toilets, etc. So yes, I can and will do plumbing myself, but it’s definitely not something I’m good at, nor is it something I enjoy. At all. You have amazing talent. I look so forward to your emails with all of your updates on any of your projects. I can’t wait to start seeing what your new home will be like. Have a Blessed Day. Fantastic makeover. I’m in the middle of a bathroom makeover as well and I’m replacing the tile counter top with wood as well……..mostly because I saw you do it. I’ll send you photos when we’re done. I was just going to change the paint color and then it snowballed in to a complete remodel. Thanks for all the ideas! Love this tiny room of yours. Great colors. So much style for such a small space. job well done! Nice work, don’t sell yourself short…..it really is great. Beautiful job! Curious about the pretty little picture above the toilet. Did you paint that yourself? Goodness – You’re a woman of many talents! I am brand new to your site and am enjoying it so much! I’ve never been much of a “DIYer” in the past, but now that my boys are grown and out on their own, I’ve discovered a little “DIYer” seed in me that I never knew I had is starting to grow! I don’t have access to power tools so I can’t do any projects that involve their use, but any of your other ones that don’t need them are so interesting to me. Do you have a link to how you painted your pic? So pretty and fresh and bright! I love it!! Great tip about the hardboard versus tongue and groove walls. We did the tongue and groove paneling horizontally in our laundry room and I like it… but wanted to do more the plank style in our upcoming kitchen reno. Interesting you say it is easier to work with… that might be a great sell to my husband. You did a fabulous job on this bathroom. Amazing how many beautiful and unique touches you managed to add in such a small space!! I LOVE this bathroom. Even though you had to keep the old vanity and couldn’t retile the shower, I just love it. I’m head over heels with the shower curtain. That fabric just completely does the bathroom for me. I’m not a huge blue-yellow fan, but this is def the exception. Everything looks so clean! haha and not only because I’ve seen the before pics. I think you did an outstanding job. Seriously? OMG, the transformation is just amazing. I get giddy when I see before and afters like this. I did a bathroom transformation and it wasn’t this nice and I kept going in and looking at it. You must do that all day. It’s fantastic Kristi. Another great job. 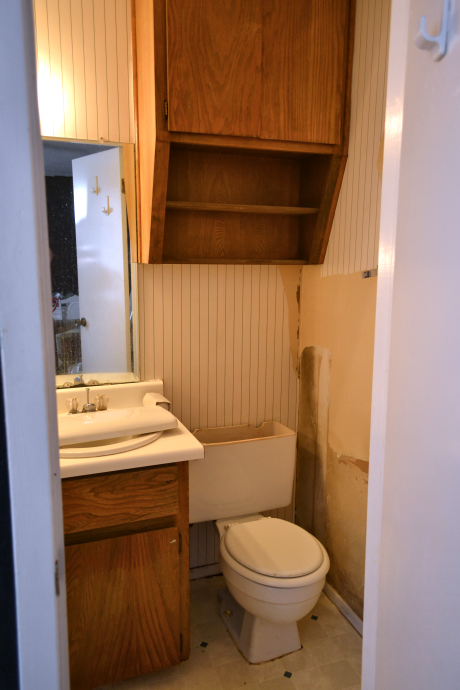 Don’t be so hard on yourself Kristi – this is an amazing makeover of a very tiny bathroom. It looks fresh, clean, bright and warm. 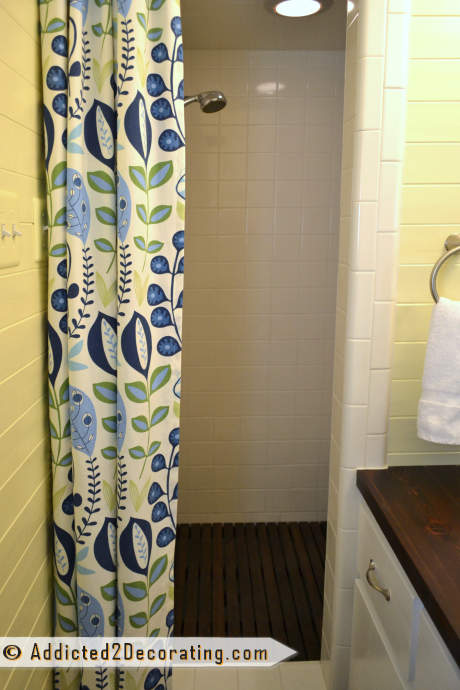 The wood tones really warm it up and that shower curtain is the perfect pop of color. Great job! Loving your site and your intestinal fortitude. I thought I was pretty good but you certainly have me well beaten with you building/fixing, etc. talents. I am so happy I found your site. I wanted to let the lady know who found an electrical connection in her bathroom wall where she wanted to place a mirror. Please let her know there are mirrors that also have lights actually in them and they are wonderful! I have them in two of our bathrooms and love them. Have had them almost 8 years and they are still lovely, working great, and we were so glad we found them. I don’t know if this helps but it may save her some electrician-type money. I want to know what you used on the top of the vanity where you installed the wooden top and the cedar pieces. They still look just like new and we had put wood on one of ours which now has little hairline cracks appearing any place water seems to be hitting it. I painted with quality paint, used 3 coats and then 2 – 3 coats (can’t remember), of good quality poly. Why are mine already needing repair/replacement after only a year and not yours? Is it only the difference in the cedar? Please advise. I want them to look like yours. Thank you so much and keep up the good work for all us ladies out here with drills and other tools. Oh wow, I have no idea why that would be happening. I used Minwax stain followed by three coats of Minwax polyurethane (the real kind, not the water-based kind), and it holds up great. I do have hairline cracks between the boards where the wood filler that I used shrunk, but I’m okay with that. It just gives each board a little definition, and I’m okay with that. The cracks aren’t big enough that they would actually have gunk collect in them and make it difficult to clean. Just little hairline cracks that could probably be filled in with another coat or two of poly. The only thing I could think of is if you used oil-based paint and then coated it with a water-based poly? Sometimes you’ll have issues if you use a water-based product over an oil-based product, and it’ll cause peeling and cracking. I love the wood in the shower, how rustic! Great use of the space. Even though it’s a small bathroom, you managed to make it look spacious with your colour/design choices. Looks great! I love all of your projects. This room is so pretty. What is the name of the groutable vinyl tiles you used? I need to redo my 1/2 bath & laundry room, want something easy/cheap to use but looks great to match the laminate through out the rest of the 1st floor. They’re TrafficMaster from Home Depot. The color is called Shasta. What’s the status of the condo. Are you going to sell or rent? Either way, it will be snatched up immediately, I’m sure of it. Happy New Year! I love the vanity counter! Our bathrooms are in dire need of help. Just not in the budget. 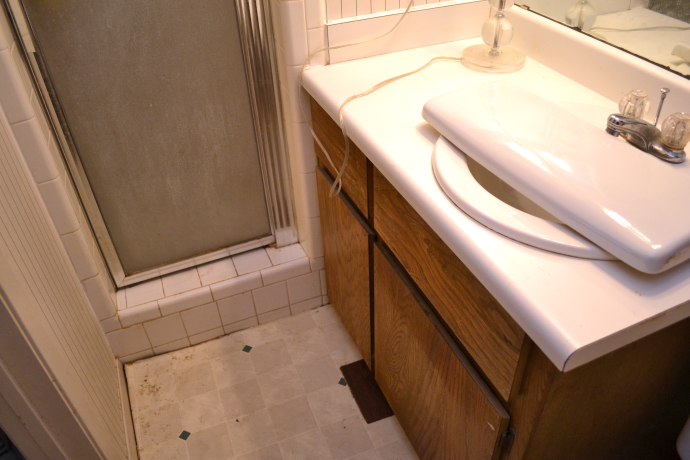 One bathroom has floor resembles your before pic. Our counters are 70’s marble one blue one harvest gold. The blue bathroom has blue mosaic floor tiles that weren’t lined up. Ugh! Both bathrooms have one piece surrounds. I wish you could come over to my house to play. I absolutely love everything I have seen on your blog for room makeovers. You truly have a gift. What is the countertop? Did you stain it or just purchase it that way? Love what you did with the mirror! L.O.V.E the shower!!!!!!! so modern n cool!!!! Looks great! Where did you get your decorative curtain? I love it! I love the colors you selected. That storage cabinet over the toilet is a good use of space and it looks nice in white! I really do like the room. How charming! 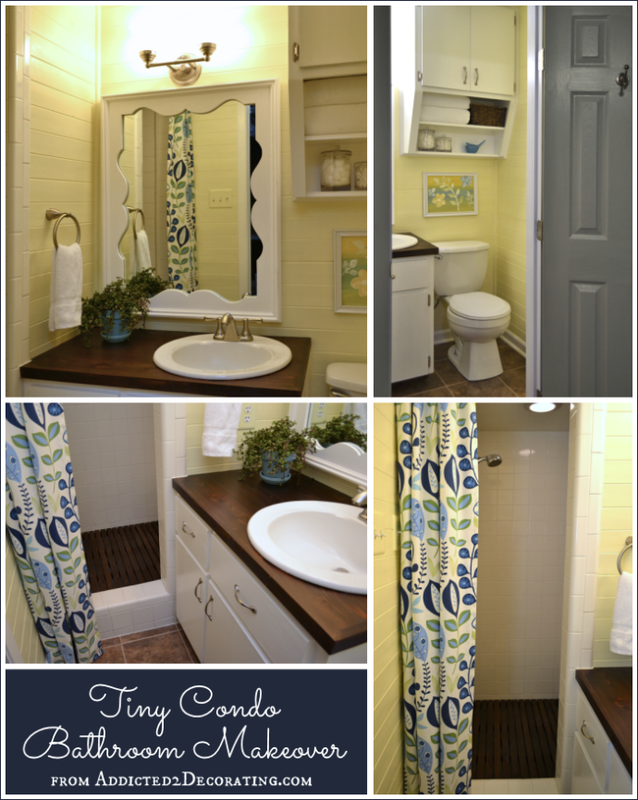 It has a lovely cottage look, and I love how the shower curtain and blue door add that perfect pop of color. Great transformation. Its look charming. 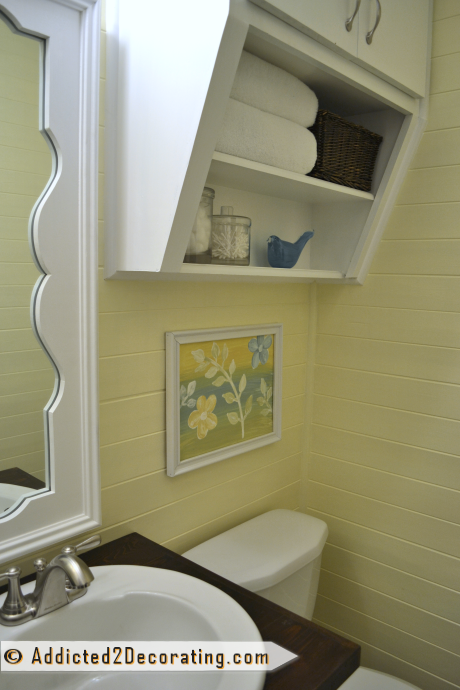 That storage cabinet over the toilet is a good use of space and it looks nice in white! I really do like the room. How appealing! Hi from Sharon: I have been reading your blog for the past few weeks and I really like the way that you remodeled this bathroom. The colors that you used are very pretty and bright. I love the shower curtain that you made.. I have a condo as well with a 1/2 bath that was disgusting looking. I have been remodeling my 1/2 bath. 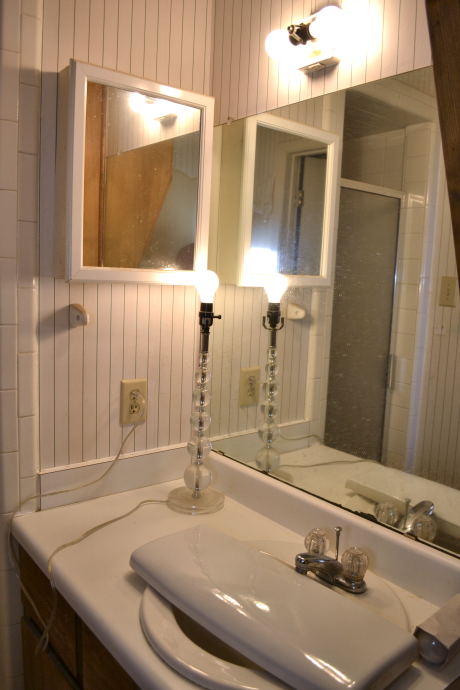 It used to have an ugly wooden vanity, but I had that taken out and replaced with a nice small pedestal sink. I also had horrible looking floor vinyl tile and I updated it with some new vinyl tile from Lowe’s. I also just painted my bathroom a nice aqua blue color. before I painted it, it had old dirty looking wallpaper, which I tore out. I plan to get some new vanity lights at Home Depot or Lowe’s later on this year. My 1/2 bath looks so much better now with a fresh coat of aqua paint, white pedestal sink and new vinyl flooring. I plan on working on my main upstairs bathroom sometime in 2016. Take care. The bathroom looks amazing! Where did you buy the curtain rod extender? 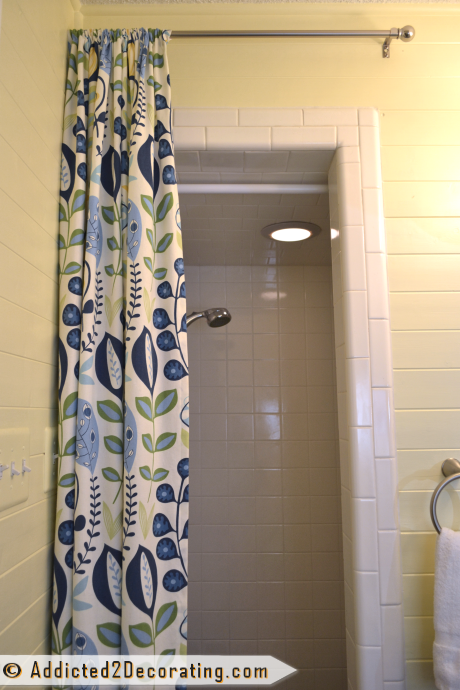 I have a tile stall shower that would benefit greatly from a new curtain! I so love this bathroom. It came out lovely and gives me ideas for my gross tiny bathroom in the basement. 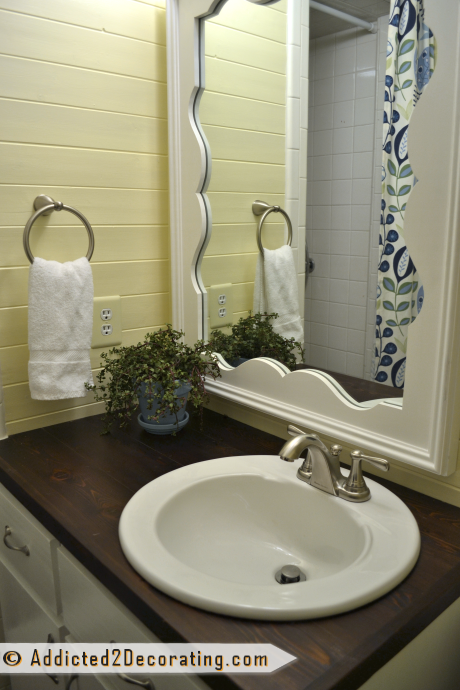 I think this little bathroom turned out very pretty and cheerful! I have a bathroom that’s probably even tinier than this one, and I also have a question. The problem with my bathroom is mold in the shower. Even though we have a fan, mold still forms in short order. Were you able to prevent rapid mold growth when you lived in the condo; and if so, how? Also, I would think that the wood mat would have caused even more mold to find a home underneath it. I’m going to be redoing the bathroom soon, and I like the idea of the wood, but it also seems like an invitation to more problems. Unfortunately, this is the en suite bath for our master bedroom, so the shower is used daily. Years ago the original owners built this bedroom as a studio apartment. We turned the kitchenette into a walk-in closet (great storage in those old wall cabinets). There’s a bigger bathroom with a tub/shower downstairs, but the bedroom is smaller, and there’s only a little closet; so that’s the guest room. We never had a problem with mold in the bathroom. I’m not really sure why, but it was just never once an issue we had to deal with.